*136-174/420-520 MHz Dual Frequency display, built-in VOX function (voice operated transmission), programmable keyboard, function "beep" on the keyboard. *You can get 128 memories channels, commercial FM radio receiver(65MHz~108MHz). 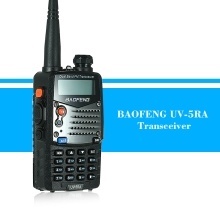 *Built-in VOX function, large LCD Display and built-in LED Flashlight. *Li-ion battery with high capacity, battery saver and low battery alert. *Incorporates 105 Codes "DCS" and 50 Privacy Codes "CTCSS" programmable. *Super sound quality and easy to carry, hanging at the waist or hold in your hand. *Must buy in pairs for your normally talking use.